There are two entwined themes running through the Matisse: In Search of True Painting show at the Met: serialization and reproduction. You have serial criminals and Matisse was a serial creator starting one idea and playing it over again and again. Two early works in the current exhibit, “Nasturtiums with the Painting ‘Danse’” 1 and II (l912), exemplify this repetitive impulse, incorporating as they both do, an even earlier Matisse work. Matisse’s Paris Studio was located at the l9 Quai Saint Michel and from his window he could see Notre Dame to the right and the Pont St. Michel to the left. A wall of the current show is dedicated to a succession of paintings culminating in a total abstract view of the Notre Dame (“Notre-Dame,” l914). On the other hand Matisse also loved recording his own creative process, so that in the case of “The Large Blue Dress” (l937) he employed a photographer to document the painting’s evolution. His l945 show at the Galerie Maeght which displayed six paintings shown earlier that same year in the Salon d’Automne were similarly accompanied by photographs which witness the artist’s creative process. 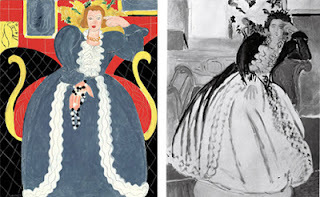 A whole book could be written about Matisse’s use of black, particularly in the “Interior at Nice” (Room at the Hotel Beau Rivage) with its striking black bar above the window and “Interior with Violin (Room at the Hotel Beau-Rivage), but one thing is certain. In all these works, figuration increasingly became a footnote to the fields of color that are the hallmarks of Matisse’s abstraction. “Why should I paint the outside of an apple however exactly,” the curators quote the artist as saying, “What possible interest could there be in copying an object which nature provides in unlimited quantities?” However, the viewer of the current show might well ask, what then accounts for the decidedly decorative element in Matisse’s work?